Boobs4Food. Passion for food meets passion to feed. 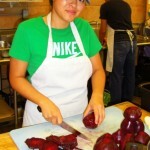 Founded in July of 2009, Boobs4Food is a volunteer supported organization committed to bridging passion for food & the passion to feed the hungry. We organize monthly volunteer events, open to the public, at local hunger awareness organizations, agencies and hunger related special events (currently in San Francisco Bay Area, Los Angeles and in NYC). Recognizing that food is a necessity that unites us all, Boobs4Food strives to unite the food-loving community with those for whom the next meal is an uncertainty. Since 2009, together with our volunteers, we have contributed over thousands of volunteer hours to hunger agencies & organizations including San Francisco Food Bank, Los Angeles Regional Food Bank, Glide Memorial, The Midnight Mission, Share Our Strength, Taste of The Nation, Second Harvest Food Bank, Project Open Hand, FoodForward, Project Angel Food, Food Runners, Hawaii Food Bank, Food Bank for NYC, Taste of the Nation NYC. Please join us as we empower our love of food to bring food to those in need by bridging our philanthropic efforts to fight hunger within our communities: in a way we can all make an impact at any age, in any language, with the universal language of food. Events are also listed on the “Events” tab or you may check out “Latest Boobs4Food News & Events” on the sidebar. Join our Boobs4Food Facebook Group and keep up to date on volunteer events at our Boobs4Food Facebook Group Events Page! Don’t forget to follow @Boobs4Food on Instagram!